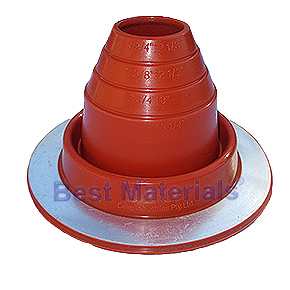 PRODUCT: #2 ROUND BASE RED SILICONE PIPE FLASHING. 6.21" DIAMETER BASE. OPEN TOP. FITS 1-3/4" to 3" PIPE, ETC. PRICE/EACH. SEAL... Apply a bead of sealant between Master Flash base and roof and at top edge to pipe. #2 ROUND BASE BLACK EPDM PIPE FLASHINGS. 6.2 Inch DIAMETER BASE. 1.4 Inch OPEN TOP. FITS 1-3/4 Inch to 3 Inch PIPES. PRICE/EACH.